This will show a window where you can enter the credentials for this execution of the script. Using this technique, you will never expose your credentials in a script. This way, you will need to enter manually your credentials for every execution of the scripts which make scheduling very difficult. 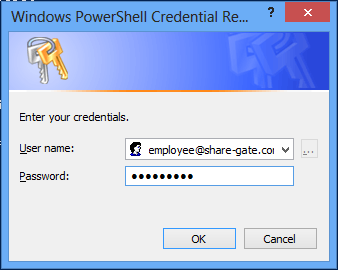 It is possible to output the secure string generated by PowerShell for your password. It is not possible for a user to decrypt your password this way but someone could take the encrypted password and use it to do something else. Anyway, it is possible and here is how. You need to first create a small script to get the encrypted password. As you can see, your password will not be shown in plain text, but keep in mind that it would still possible to copy the secure string and use it in another script. However, since secure strings are generated using your local machine encryption key and the current user's permissions, they can only be used on the same machine and cannot be transferred to a script running on a different machine.